Broom or vacuum, moisture meter, chalk line & chalk, tapping block, tape measure, safety glasses, hand or electric saw, miter saw, 3M blue tape, hardwood floor cleaner, hammer, pry bar, color wood filler, straight edge, trowel and tapping block. 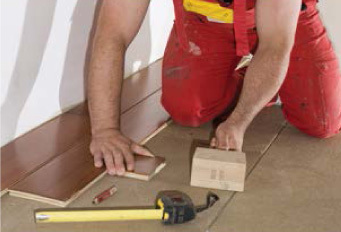 Failure to use a tapping when installing engineered flooring can /will cause splintering. • Distribute lengths, avoiding "H" patterns and other discernible patterns in adjacent runs. Stagger end joints of boards row to row a minimum of 6" for strip flooring, 8-10" for 3" to 5" plank, and 10" for plank wider than 5" for better visual effects when possible. However, the length of the material may dictate end joint proximity. Close end joint proximity may affect structural stability on mechanically fastened installations if there is deflection of the substrate present. • Preferred sub-floors - 3/4" CDX Grade Plywood or 3/4" OSB PS Rated sub-floor/underlayment, sealed side down, with joist spacing of 19.2" or less; Minimum sub-floors - 5/8" CDX Grade Plywood sub-floor/underlayment with joist spacing of no more than 16". If joist spacing is greater than 19.2" on center, add a second layer of sub-flooring material to bring the overall thickness to 1-1/8" for optimum floor performance. Hardwood flooring should be installed perpendicular to flooring joists. If flooring is installed parallel with joists, then an additional layer of ½" plywood must be installed to meet minimum requirements of 1-1/8"
• As an alternative method of concrete moisture testing, In situ relative humidity testing may be used (This is the preferred method). Reading shall not exceed 75% relative humidity. 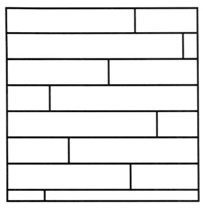 • Stagger the ends of boards and maintain at least 6" between end joints on all adjacent rows when material permits. • Top-nail and blind-nail the first row (hand nail if necessary), using appropriate fasteners. Blind nail at 45° angle through the tongue 1"-3" from the end joints and every 4-6" in between along the length of the starter boards. Each succeeding row should be blind-nailed whenever possible. Narrow crowned (under 3/8") 18-20 gauge thickness fasteners - Length of fasteners as follows: 1 1/4"- 1 ½" staples or 1"- 1 1/4" cleats designed for engineered flooring. 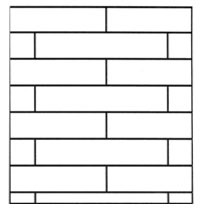 3/8" flooring would use a minimum 1" fastener, 1/2"- 9/16" flooring would use a minimum 1 1/4" fastener with 1 ½" being preferable. Spacing of fasteners should be as follows - Staples should be placed every 3" - 4" and cleats should be placed every 4" - 6". All fasteners should be placed within 1" -2" of end joints. 1/2" crown - 15 1/2 gauge staples typically used for solid wood flooring should not be used. Fasteners should hit the joist whenever possible. To ensure proper alignment of flooring, make sure the flooring along the working chalk line is straight. • Sub-floor flatness is critical to the success of a floating floor installation. A flatness tolerance of 1/8" in a 10-foot radius is required for floating floor installation. • Install leading brand pad - 2 in 1 or 3 in 1. Follow pad manufacturer’s instructions. If it is a concrete sub-floor, it is required to install a 6 mil polyethylene film.